We've spend a lot of time this year talking about how the NFL seems to be trying to tone down the brutality in football. For the most part, it their efforts seem less sincere and more like public relations, because the rules -- which Roger Goodell appears to make up as he goes along -- are enforced in such an arbitrary way, no one seems to know why some hits are deemed illegal while others are celebrated. The truth is, football is brutality. It's stylized violence, and it's always been, whether it was Night Train Lane doing the hitting or James Harrison. And if you take that away, it stops being football, and it becomes something else. On many levels, that's OK. It's good for the game to continue to evolve, and maybe the things you love the most about football are exactly what Goodell, the NFL owners, and the major television networks, love promoting about the game: star quarterbacks and lots of scoring. But what I love most about football is the way it tests some men. The way it asks them to mentally block out their pain -- pain that is usually a byproduct of all that brutality and stylized violence -- and continue on, typically out of loyalty or honor. You were dazzled by Ray Rice's long touchdown runs against the Bengals? So was I. But deep down, there was someone on the field that day I admired even more. 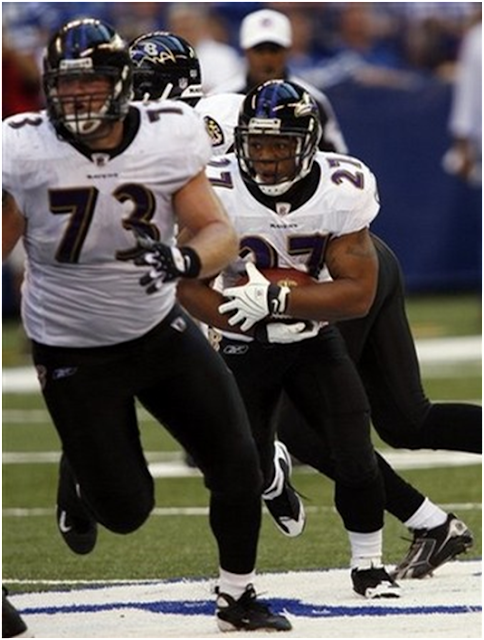 It was Marshal Yanda, who threw bulldozing blocks for Rice in that game, even though his ribs were so badly bruised it looked, and according to him felt, like he'd been kicked by a mule. Yanda, who injured his ribs the week before in a win over the Browns, was in so much pain during the week leading up to the Bengals game, he couldn't even bend to put on socks and shoes. "I just wore sandals," Yanda said. "That way I could just slip them on and go." Everyone outside the Ravens organization assumed there was no chance he was going to play. And if they had talked to Yanda on Wednesday or Thursday, they would have been correct. "Early in the week, I was in so much pain I was like 'There is no way I'm playing,' " Yanda said. "I was on some pretty heavy prescription drugs just to calm my ribs and legs down so I could sleep." But having gotten to know Yanda a little bit over the last few years, I had my doubts he was going to be in street clothes when Sunday rolled around. Deciding you're not tough enough for the task at hand, and that you can't tolerate how much it hurts, just isn't in his blood. It's the same thing that drove Terrell Suggs to play in the AFC Championship game three years ago with a dislocated shoulder, which to this day is one of the most impressive displays of guts and toughness I've ever witnessed. (He sacked Ben Roethlisberger twice with one arm.) Yanda and Suggs could scarcely be more different. But they have remarkably similar philosophies when it comes to football. It's a game of toughness, of honor, and of loyalty. Everything else is secondary. For the most part, we've become a society of caution, of prudence, and of rationality. If you're employed by someone -- and most of us are, because as Bob Dylan said, you gotta serve somebody -- you might love your job. But it would still be extremely rare for you to feel so loyal to your coworkers, you'd come into work with broken ribs. Even your coworkers would consider that irrational behavior. Your job would have to be at stake. Football is different though. Football is not part of the rational world. Yanda was going to be paid whether he played or not against the Bengals, but he did not wish to look his teammates in the eye and acknowledge he could not contribute when they needed him the most. As foolish as it may sound, that's what I love about the game. Not beautiful touchdown catches, or breath-taking runs. The moment when a man puts himself through hell because he cannot let his teammates down, or let the pain win. Every time Yanda grimaced, or struggled to stand last week, he thought about what was at stake for the Ravens against the Bengals. A win meant a first round bye and a home playoff game. It meant a much more realistic path to the Super Bowl. He didn't want to think about what a loss might mean. "I wanted to be able to play, and be a part of that win," Yanda said. "I knew they needed me to win. So I just sucked it up and played." On the fourth play of the game, his pain dulled by adrenaline, he locked up with Bengals linebacker Ray Maualuga on handoff to Rice. He bulldozed Maualuga backward with remarkable ease, and Rice dashed though the hole. He didn't stop running until he reached the end zone, 70 yards later. "Malaluga ran right into me and I just mounted him up," Yanda said. "I could almost feel Ray behind me, and went I saw his legs going, I knew he was gone." It was a beautiful block and a beautiful run, exactly what the Ravens envisioned when they signed Yanda to a big free agent contract during the off-season. But there was still a ton of football to be played. Yanda grimaced and growled his way through the rest of the game, and on Rice's second long touchdown run, he got slammed to the ground and landed on his side. He was in so much agony, he asked Matt Birk to fill in for him on the extra point. But he was back in the next series, helping close out the game. "After the game, everybody was celebrating and wanting to give me a hug," Yanda said. "I was like 'Get away! I'm dying here.' "
There are little moments in every special season that loom large once they're in the rear view mirror. Maybe Marshal Yanda's decision to grit his teeth and stand with this teammates for one more fight in the regular season will seem irrelevant a few weeks from now. But maybe not. Maybe it was evidence this team cares enough about one another to fight like hell, block out the pain, and extend the journey for as long as possible.